When my son Ayaan got centum in maths I was overjoyed and praised him for his hard work. He gave me a weak smile and retreated back to his room. An adolescent crisis is it? I came back from work and after a hard day my son, Shayan asked me to play with him his bow and arrow. I gave him a box of his favorite chocolates instead which I had picked up on the way back home. To my utter shock, he gave me a lukewarm response and resumed his activity. Have I spoiled my kids with too much of affection? All these thoughts came to my mind. It was then I realized probably all my assumptions were wrong. I wasn’t actually speaking the language of love which my children understand. Children comprehend and receive the language of love in different ways and it varies from child to child. Some children might understand it through acts of service while others through positive affirmations or even rewards and physical touches like a warm hug, a kiss or a pat. You got to know what your child needs and act accordingly. Well, there are many ways you can shower your love in a way that directly reaches your child’s heart and mind. Love is a beautiful thing as we know and it does wonder when you shower your love to your children in a language that they can understand and acknowledge. 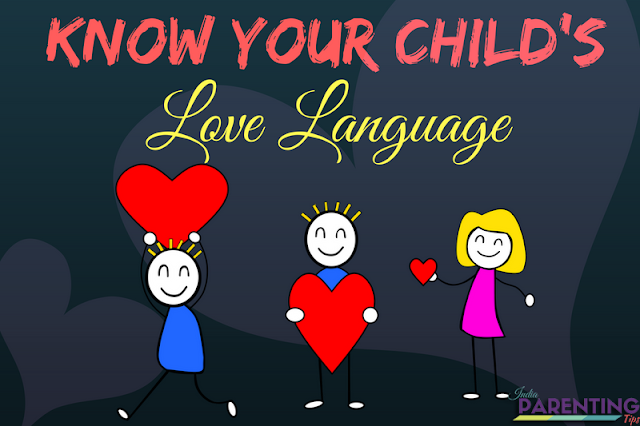 Why love language for your child is so important? Love language is not just for kids or couples or that special someone we know or want to know more. It is for everyone who is an important part of our lives. It might be your best friend, your relative your neighbor or anyone else. Learning the art of communicating your feelings through actions that could communicate your feelings appropriately indeed is an art. It is imperative to learn this art to live a happy fulfilled life as an individual as well as for the community or society at large. 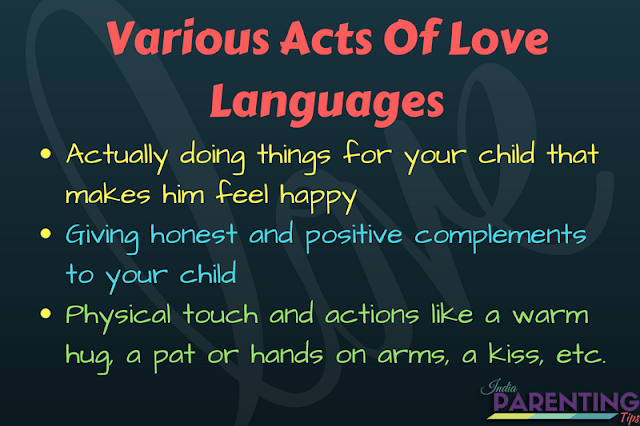 How to develop a love language for your child? Know your Child: Each child is a unique individual who deserves to be loved in their own peculiar way. You got to know your child’s need and love him or her in a way that he or she can understand your love better. For example, if your child needs a hug and you buy him an expensive gift, there creates an imbalance between his or her need and your action. Know yourself-Also we all have our own special reasons to love a person be it a child or an adult in our own way. For example, if your love language is caring for your kids, you would invariably spend more time caring for your child whenever and however possible. It is important for you to know that as well. Bridge the Gap-Once you know your child’s need and you know what love language you are best at, the next step is to bridge the gap for your child. You need to fill in the gaps and close the space if any. The focus should always be on your child and not you. For example, you might be good at giving quality time to your kids while all your child wants is some positive words of appreciation and affirmation. When you know that, you need to focus on that whenever you plan to spend quality time with him or her. What are the various acts of love languages? I never knew about various languages of love until my friend had gifted me a book written by Gary Chapman, The Five Love Languages, that made my eyes wide open to understand how important it is and how can our simple actions can turn to love languages bridging the gaps and fulfilling the needs for children and adults. Acts of service - This means actually doing things for your child that makes him feel happy and loved. Every child indifferent. Some children need to be taken care of by doing things for them. It is then they realize that they are being loved and looked after with care. It can happen to children of any age group. Sometimes elder children need acts of service. For example, when there is a newborn in the family, a new sibling, they might feel neglected. In this scenario, if you do small things for him or her like ‘let me get you your favorite snack’ for example that might make him feel more secure and loved. Let’s pick your friend on the way to the movie/PlayStation. Let’s go to your favorite game station to play. Shall we plan a small party for your favorite doll? Words of affirmations - This actually means giving honest and positive complements to your child. Some children need to be told and reassured time and again that they are being appreciated for crossing their milestones and doing things what they are expected to do. It gives them fresh energy and boosts them to do even more. You are an awesome kid. Physical touch and actions - We all must have heard about the power of physical touch healing and comforting emotions. Here are some ways we can shower our love language through physical touch and actions. Simple gestures like a pat or hands on arms. A friendly cheer or Hi five. Children of all ages need physical gestures of love from their parents. When they are infants and toddlers we always hold them close to our arms and hug them and shower them with all our affections. As they grow older, they seem to become different and we think they do not need such pampering as they might feel embarrassed if we treat them like a child. This is not true. Older children also crave for such gestures. Only the ways might differ. It can be a friendly hug or arms around his shoulder sometimes that can make him or her feel loved, wanted and comforted as well. Giving quality time – This is a very important aspect of love language. Giving the adequate amount of time and more important quality time to your children is absolutely essential for his or her mental, emotional, psychological growth and development. We need to make sure we should spend daily at least half an hour to 45 minutes of quality time with our children. It can be watching a match together, or fun cooking with Momma, or an evening walk, you need to ensure that you spend enough time daily with your child and not push it to weekends as a task. Let's watch your favorite sport together. Shall we go out for a short walk? How about trying a new recipe with Mommy/ Daddy? Would you help me to cook your favorite dish? Rewards and recognitions - Like it is imperative to ensure rewards and recognition in our corporate world, it is very important that you acknowledge your child’s progress and success and reward him every time he or she crosses his own milestones. This way your child would get positive affirmations and compliments that would help him or her to strive for even higher targets. Remember! Rewards should not invariably be in terms of money or expensive gift. I made your favorite food. I have got a surprise for you. My conclusion after getting married and having three kids is that these love languages are very important to know and act with complete dedication. It is not only for your child, it is great to talk about it to your spouse as well. It would bridge lots of unseen gaps and nurture your relationship thereby helping your children live in a happy loving environment. Love your child the way he or she needs to be loved. Love your spouse or partner and shower him or her with love languages he or she understands. That’s one secret to a happy loving family.